Join me in Port Townsend, WA, Saturday, February 24 to learn tools and techniques for painting expressive skies in watercolor. We will explore design, color mixing, and applying glazes for atmospheric compositions. 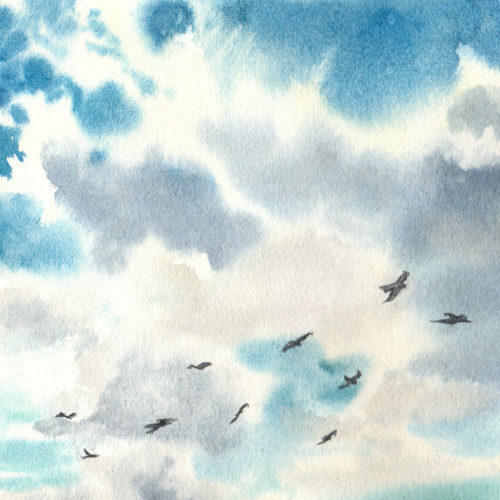 You will have the opportunity to paint four distinct cloudscapes based on photos, from misty mornings to windy afternoons and layered sunsets. All levels welcome! Learn more and register through the Port Townsend School of the Arts. Hi! A few of us from Painted Ladies Group in Mt Vernon are interested in your Cloudscapes workshop. How many spots are still available….if any? We meet on Wednesdays so want to discuss possible trip to Pt T.